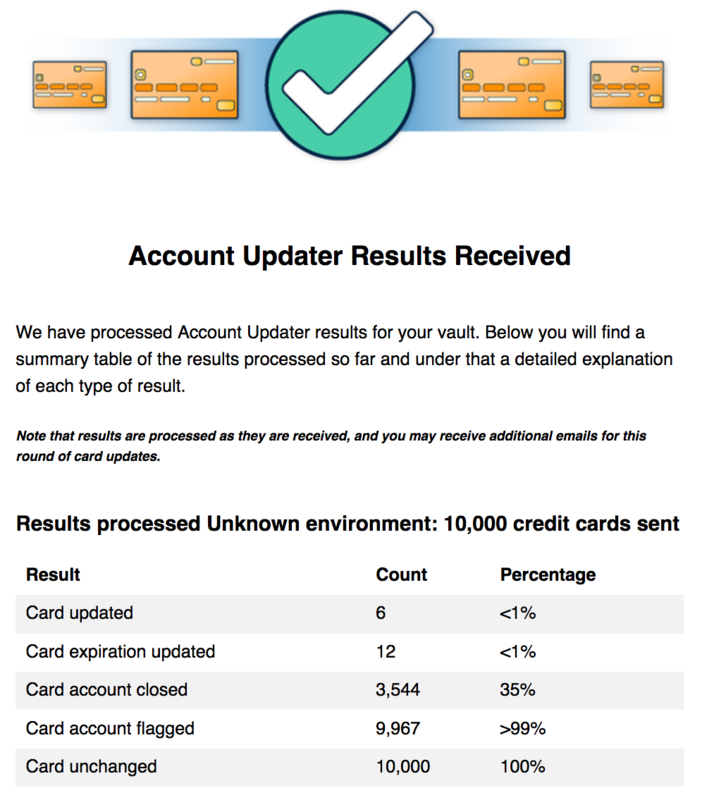 Spreedly’s Account Updater allows you to always keep your customers’ card details up-to-date. When your customers’ credit card numbers expire or are updated, Account Updater protects you from the lost revenue, involuntary churn and decreased customer satisfaction associated with outdated payment information. Who is eligible for Account Updater? Which cards are eligible for Account Updater? Which of my cards will be updated? What do I need to do once I turn Account Updater on? How do I know when my cards are updated? Can I leave the Account Updater program? All customers are eligible to opt into the Account Updater feature. There is no up-front cost to turn on the Account Updater feature. Once you opt-in, Spreedly will submit all of the cards in your Spreedly vault for updating twice monthly, on the 1st and 15th of every month. You can also opt in on a card level. The cost of Account Updater can be seen on the pricing page in the Add-on section. Account Updater costs will be added to your monthly subscription renewal charge. If you exceed your plan usage levels before your renewal date, any pending Account Updater fees will be added to the total cost of your upgrade. For more information, please view the Account Updater section in our Terms of Service. Click the toggle to opt in (it will move from gray to blue) and click "Save". Once you opt into Account Updater, you can select which of your cards will be sent to the card networks for updating. By default, all payment methods are going to be included in Account Updater. In order to exclude payment methods from being sent to Account Updater, you will need to set the value `eligible_for_card_updater` to `false`. This value can be set when creating a payment method or by using the `update` API call. Opting-in to Account Updater happens at the organization level - all environments will be affected. By turning on the Account Updater feature, you confirm that all eligible cards will be sent to the card brands for updates twice monthly, but you will only be charged for those cards that are actually updated or flagged. Merchants should only submit cards that they are willing to update. Cards that were marked "Card bank not in program" in prior runs might be updated on future runs based on program expansion and issuer participation. Cards are automatically updated by Spreedly in the background and your customers can continue using your service without interruption. Each e-mail will notify you of how many cards were submitted for updating, and, if applicable, how many were updated. Notifications will be sent to all members of your organization on Spreedly. Please keep your billing e-mail up-to-date as well as the e-mails of any of your Spreedly account holders to ensure your team is receiving notifications for the Account Updater service. Results of Account Updater submissions can be tracked in your Spreedly dashboard. You can view summary statistics for each twice-monthly submission (or “batch”). You can also drill into detailed per-card results and download a CSV report for any given batch right from the dashboard. ReplacePaymentMethod - The number and/or expiration date has been updated. InvalidReplacePaymentMethod - We received either a new card number or expiration date that was invalid. The payment method was not updated, but a fee is still created since our service provider still charges us in this scenario. No changes are made to the payment method. ContactCardHolder - Contact the cardholder for a new number and/or expiration date. This status is a flag, so no changes are made to the payment method. ClosePaymentMethod - The account is no longer open and should no longer be used. 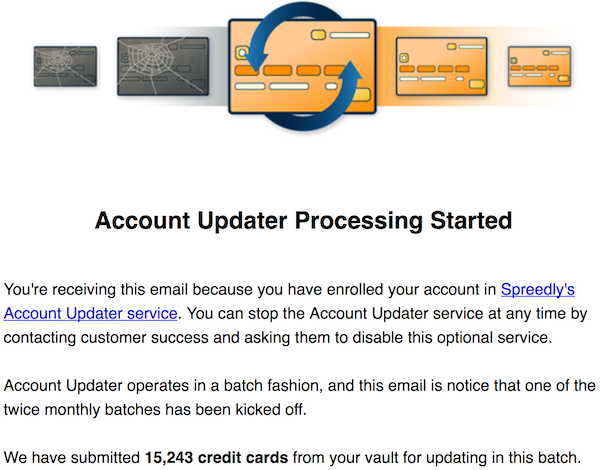 The payment method will remain available, but Spreedly’s Account Updater will no longer attempt to update it. While not preferred, you can also track which payment methods were affected by Account Updater, using the list transactions API for the above transaction types. We recommend using the dashboard method above as using the list API will result in additional fees on API pricing plans. You may opt-out of the Account Updater program at any time. To do so, log into https://id.spreedly.com, go into your Organization Settings, click "Edit Settings", turn the toggle off, and click "Save". This will remove you from the Account Updater program. Note that all changes to your Account Updater enrollment status must be made before 12PM EST the day before cards are updated by Spreedly. If you opt-out of Account Updater after this time, your cards will still be updated in the next round of processing, and you will still be charged for each updated card.